Over Chinese New Year, for only the second time ever, Tom and I took a day trip to Macau. Last time we did the main sights but this time we headed to Taipa, on the south part of Macau. According to Wikipedia, Taipa was once a much smaller island of its own but the land between Taipa and the adjacent Colaine island was filled in with an area now called Cotai. Cotai is well known for its massive casinos, but Taipa is very different indeed! There are regular ferries to Taipa from the Hong Kong Macau Ferry Terminal in Sheung Wan and the China Ferry Terminal in Tsim Sha Tsui, run by Cotai Water Jet. Turbojet also runs a few services to Taipa from the Hong Kong Macau Ferry Terminal. Since we didn’t really know where we were going when we got there, we took a taxi from the Taipa ferry terminal to near the restaurant where we were meeting friends for lunch. Our taxi dropped us off at the end of Rua do Regador, and we were a little early so we were able to wander around the nearby streets a bit before lunch. Taipa village is a lovely mix of Chinese and Portuguese influences, with narrow streets and pretty architecture. I wish I had taken more photos of this area since it was a very nice place to walk around! I did snap one of this square though, with its large Chinese New Year (I assume) centrepiece. Our lunch was at nearby Portugália, which I’d recommend. The food was lovely and so was the setting. After the children played for a while on the exercise equipment there (which is really designed for the elderly! ), we headed down to the Estrada de Cacilhas. These lovely restored green buildings house the Taipa Houses Museum. Alas, we have small children who aren’t very interested in museums so we didn’t go inside, so I can’t tell you what the museum is like! Across the lagoon is a grand view of casinos. Slightly different from Taipa village! …sadly these trees were fake! If you’re heading to Macau but looking for an escape from the hustle and bustle of the main sights and the high rise casinos then you might want to head over to Taipa village. It’s small but I think it’s a lovely way to pass an hour or two. In March, we spent a week staying near An Bang Beach which is just outside Hoi An in Vietnam. After our holiday in Kyoto last September, we wanted to do as little as possible on this holiday, and I think we pretty much managed that! So there’s not a lot to tell you really, but it was such a lovely place to visit that I thought I’d share it with you. We chose to visit Vietnam partly because it is a very short flight from Hong Kong! Only 1.5 hours (which you would think would be short enough to make it ok with 2 year old twins, but there were still issues *sigh*). Also, the flights were pretty cheap to Da Nang from Hong Kong. And the airport is only a 30 minute drive from An Bang, so it’s quite convenient. We stayed at Be’s Beach Bungalow, which is a lovely little single storey cottage, run by the equally lovely Aaron. We found it through good reviews on FlipKey website. From our first contact, Aaron was very accommodating and helpful and managed to find us two cots for the twins. He also sent a grocery list so that we could order some groceries to be waiting for us when we arrived! The bungalow itself is really pretty and well-equipped with 2 double bedrooms, 2 bathrooms and a kitchen inside. Outside there is a long porch with an outside day bed, low chairs and a coffee table, sun loungers and dining chairs and table. It could easily accommodate two couples, but it worked very well for our little family of 4 too. The couple that live next door look after the property for Aaron and they clean daily and can order taxis for you (helpful to get into Hoi An). They even put a paddling pool out for the kids! One additional thing that we really enjoyed was a home cooked meal – it was cooked next door and brought to us! It was a lovely treat for us because we can’t go out for long dinners in the evening because the kids were in bed. It helped that the food was really delicious too! The bungalow is situated in the village of An Bang, which is a pretty quiet, local area, although I hear it is getting more popular with homestays and tourist cottages like the one we stayed in. There was some general night noise but nothing too bad apart from one night when there was some sort of local festival – it was like someone was playing a sound system on the highest setting in our bungalow! But thankfully the kids slept through it (I have no idea how) and it didn’t go on too late. The village has lots of little restaurants (see below) and a few mini marts dotted around which was helpful for getting snacks and breakfast cereal and things like that. The beach was literally a 2 minute walk away from the bungalow (behind the house next door) and had sun loungers with umbrellas available to rent for VND40,000 (about £1.30) per pair per day.It was a nice beach with lots of shells and good quality sand but not that wide. The sea was very cold when we went (in March) so we didn’t swim in it but did a bit of paddling. It also got very rough and strong after a day of strong winds and you wouldn’t have been able to swim in it then even it had been warm enough! The beach was pretty quiet by where we were staying but the closer you get towards the main restaurant strip the busier it gets (only a few hundred metres away). As I already mentioned, a short walk down the beach was the main restaurant area where day trippers from Hoi An tend to go. There are lots of restaurants there and we tried a few and enjoyed them all. The atmosphere is pretty laid back and it was mostly a fairly young crowd. Actually, there weren’t many families that we saw in An Bang, but I don’t know why that is – maybe they tend to go to the bigger resorts around Hoi An and Da Nang. But as with a lot of Asian places, children are very welcome and very loved here. Ours got a lot of attention, but it was very friendly and we didn’t mind it. We spent most of our time in An Bang but we went into Hoi An 3 times, twice in the morning and one evening. It was generally not too crowded in the morning although there were plenty of tourists around all the time. The evening was much busier, especially by the river. Hoi An is a beautiful old town, one of those places (like Penang in Malaysia) where development halted, in this case due to the river silting up preventing further trade, and therefore the old buildings were preserved. It was much more touristy than I was expecting – every single building is either a souvenir shop, restaurant or tailor’s – but it still has a lot of charm though. …and a couple of other places. You could do the whole place in a morning if you wished and still manage to see pretty much everything but our pace was a lot slower with the kids! We enjoyed shopping there too, although many of the shops sell the same thing. Our prized purchase was a large teal coloured Vietnamese style lantern, which was surprisingly cheap (less than £5). We didn’t visit any of the tailor’s but if you want some clothes made up you really are spoilt for choice! French Bakery and Restaurant (I’m not sure if this is actually the name) – just a few doors down from Cay Me, great pancakes and pastries. We went there for breakfast a couple of times. Purple Lantern – just off the main village road (although there is a handy sign on that road pointing to it). Nice outdoor area to eat in, good food. Sou – one of the beach side restaurants, probably the most ‘local’ place we ate. The food was good but there was little effort on service or presentation! Soul Kitchen – another beach side restaurant, we went there twice because it was a nice place to hang out, and the food was lovely (both western and local dishes). It has a very laid back international vibe, and outside there is a nice grass area with booths and loungers. Miss Ly Café – great food and a nice atmosphere. Our favourite restaurant in Hoi An. Mermaid Café – I think this place is quite famous. It isn’t very big but it wasn’t that busy when we went for lunch at about midday. The food was lovely. Cargo Club – we stopped here for a drink and a pastry. Nice decor, and yummy cake. Ancient Faifo – this was the priciest restaurant we ate in, but the food was wonderfully presented and a delicious mix of Vietnamese and western flavours. Another beautifully decorated place, and the service was very good too. So, I hope this has tempted you to visit Hoi An and An Bang! It’s a lovely area and well worth a visit, be it a week by the beach like we had or just a long weekend of shopping and sightseeing (and some beach time too). This is the last post in my short blog series on our week long holiday in Kyoto last September. It really is a beautiful place and well worth a visit if you’re able. In the first post I covered the practicalities of visiting Kyoto, and the next post outlined the things we saw and did on our first three days there. Now for the final three days! On this day we wanted to hit some of the main tourist attractions in Kyoto so we started with Kiyomizu-dera. We took the 207 bus from Omiya to the bottom of the hill up to the temple (I think this was the Kiyomizu-michi stop) and then followed the crowds up the hill to the temple. It’s actually quite a climb, especially when you are carrying children! We had left the stroller at home for ease, but there is a disabled route within the temple grounds so you could bring yours. This was possibly the busiest place that we visited in Kyoto, even though the weather was not good that day. We found the crowds a bit much, although the bad weather did mean that our children got free run of the main verandah of the temple for a bit while it was raining! The temple comprises a few outer buildings, the main temple, the view of the temple from the opposite path, and a few extra attractions such as a waterfall with healing water. The main view of the temple is quite nice (apparently it’s pretty spectacular in spring and autumn – imagine the trees below covered in blossom or bright red leaves) but otherwise we found the temple too busy and didn’t bother exploring much of it. We then walked back down the hill and caught the bus back to Gion where we had lunch (in an Indian restaurant on Shijo Dori) and had a little wander down nearby Hanamikoji Dori, a beautifully restored traditional Japanese street. Next we took the metro south from Gion-Shijo to Fushimi-Inari and followed the signs from the station to Fushimi Inari-taisha. This is one of the most distinctive attractions in Kyoto with its thousands of orange prayer gates. N.B. Fushimi-Inari is not at all stroller friendly! There are lots of steps on the path, so I would suggest you leave the stroller at home when you go here. After spending about an hour at Fushimi-Inari, we went back to the metro and headed a couple of stops north to Tofukuji where we walked to the temple of the same name. It was a little hard to find the temple so our offline maps app was useful here. We were glad we made the effort though because it was lovely and quiet after the previous two places we visited! We started off in the gardens but in the end we didn’t make it into the temple itself because it was closing time. The gardens were so lovely though, and because it was quiet our children could run about freely and enjoy the space. On this day we took a day trip to nearby Nara. After some research we found that the quickest way to get there was to take the Kintetsu Ltd. Express train from Kyoto Central Station to Kintetsunara Station, which is very close to Nara-Koen park. The first temple that you come to in the park is Kofuku-ji, which we didn’t go in because there was a lot of construction going on, due to be completed in 2018. Instead we headed to nearby Isui-En gardens (again, I’d suggest you take a map to find your way round the park as it’s a little bit hard to navigate). Given the size of the gardens, we thought it cost a little more than other attractions to enter, but the gardens are absolutely beautiful (not stroller friendly though, but you can leave your stroller outside). Just look at this view! After lunch we headed round the corner to Todai-ji, possibly the largest wooden structure in the world (which impressed my engineer husband! ), which houses a very large Buddha inside. The temple is very impressive and well worth a visit, although it doesn’t take very long to go round. It has good stroller access, but (as the guard told us) you need to go into the ticket office, buy your ticket and then come out again to the disabled entrance on the side. It was quite busy but the temple is large so the amount of people wasn’t overwhelming. After visiting the temple we wandered around Nara-koen a bit more. 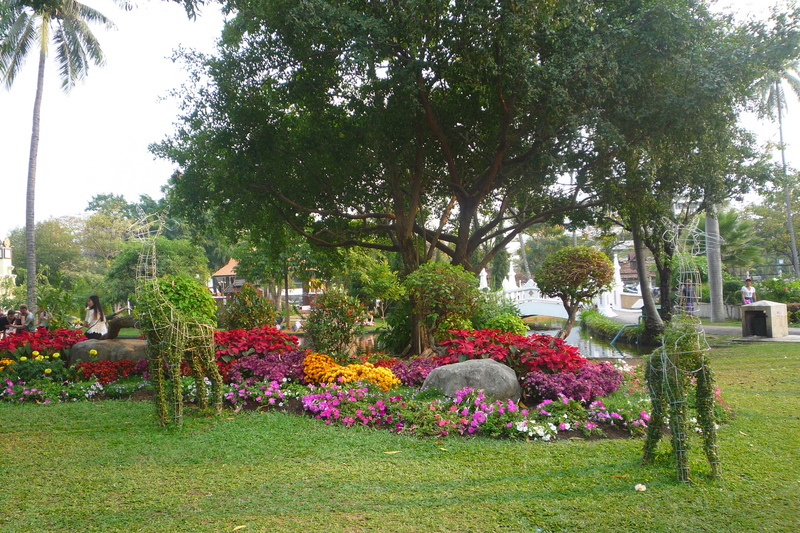 It is a very extensive and beautiful park and you could spend a long time exploring. Deer roam freely everywhere, and there are many people selling biscuits to feed the deer. I bought some biscuits and was immediately mobbed by some deer who were loitering nearby and keeping an eye out for people with biscuits! They were a little aggressive so it wasn’t quite the beautiful experience I hoped it would be! But I was very pleased to get this photo of the deer (below). They were so tame and not at all bothered by all the people walking around. On our last day we had initially planned to go to Himeji to see the castle, which only takes 45 minutes from Kyoto on the bullet train. The castle is apparently the most impressive castle in Japan, but some research suggested that it would be likely that we’d have to queue for an hour to get in (as it was a Saturday and it gets very busy at weekends) and by that point we were quite tired and the thought of travelling there and queuing with our small children was too much! So instead we stayed in Kyoto, and took the metro from Omiya to Keage. From there it was a short, stroller-friendly walk to Nanzen-ji. We enjoyed the grounds of the temple, although we didn’t go in the temple itself. We did go up the sanmon gate instead, which has nice views over the temple complex and further afield over Kyoto. From there it was a short a walk to the Philosopher’s Path. This was a very quiet and pleasant stroll along by a river (but for those of you with strollers please note that there is quite a bit of gravel which was a bit hard to push the stroller through!). A nice getaway from the busy-ness of some of the tourist attractions. For lunch, we went to Omen restaurant which was near to the end of the Philosopher’s Path. This was surprisingly busy, given how quiet the area was, but once we put our name on the list we didn’t have to wait too long for a table since the restaurant is quite large. It’s a noodle restaurant and is very delicious, a little more pricey than most but worth it in my opinion. After lunch we took a bus to the top of Kyoto Imperial Palace Park and quickly found a children’s playground within the park. This had a sandpit filled with toys to play with and kept our children occupied for quite a long time! A nice bit of respite for those of us with young children. After that, we wandered through the rest of the park (LOTS of gravel, not good with a stroller!) and then east along Marutamachi-dori to the Kyoto Handicraft Center where we purchased some souvenirs (this is not the place for tourist tat, but a lovely place to visit if you want some beautiful handmade items) and had dinner at an Italian restaurant on the same road. All in all, a nice way to end our holiday! As you can see, we managed to fit a fair amount into our time in Kyoto, despite being limited by what we could do with our young children. And we only scratched the surface – there were many attractions we didn’t visit! We loved the city, it was so quiet and peaceful and there was so much to see. I’d totally recommend that you head over there for a visit! Last week I started a short series on our week long holiday in Kyoto last September. It really is a beautiful place and well worth a visit if you’re able. In the last post I covered the practicalities of visiting Kyoto, but this week I’ll start telling you about what we actually did and saw while we were there – this is the fun part! Our twins were less than two years old when we went to Kyoto, which made sightseeing a little difficult. For some reason they just weren’t interested in zen gardens and temples! But having said that, they did enjoy running around lots of new places, and they did allow us to drag them around quite a lot, so we did manage to see quite a few different things. One point to note for other visitors with small children is that Nijo Castle isn’t very stroller friendly. There are a few steps into the buildings and around the grounds. Also, you can’t take your stroller into the main building, but there is a place to leave it. After Nijo Castle we headed back down the quiet streets in search of somewhere for lunch. (As an aside, these streets were so lovely to walk down, you could just do that all day – traditional style shuttered houses, narrow lanes, and so quiet!) We had spotted a restaurant with some English outside(!) on our way to the castle so we headed in that direction and managed to find it again – it was called Noodles Near Nijo (cute name!) and I think it was on Kuromon Dori. We both had udon noodles in soup and they were delicious. After a break back at the townhouse we headed to Omiya station and took the metro to Kawaramachi. We were heading to the traditional Shinbashi area so we left the station by exit 5 (which doesn’t have a lift), went over the bridge and turned down the 3rd left turning which takes you to Shinbashi Dori. This is a very beautiful area and apparently very strongly protected so the houses here cannot be updated. The peace was slightly ruined by the presence of a large Chinese tour party but otherwise it was very quiet. It’s not very big so it won’t take you long to walk around. We then headed east to the end of Shinbashi Dori, crossed the road and kept going until we got to the entrance of the Chion-in temple complex. Unfortunately by this time of day it was shut (we got there after 5pm) so we turned right and went into Maruyama Park instead. This is a lovely park with small winding lanes in every direction. We had a wander round and then headed back to Kawaramachi in search of dinner. We had heard that there were some nice but not too pricey restaurants on the 7th floor of the Takashimaya department store so we went there. We picked an Italian restaurant (I can’t remember the name) and very much enjoyed our dinner. They had high chairs which was a real bonus for us! We took a very old fashioned train from Shijo-Omiya to visit Arishayama, which is at the other end of the line. It’s a nice, slow ride through the neighbourhoods of Kyoto, but it doesn’t take too long (maybe half an hour). When you come out of the station you really get a sense that you’re on the edge of Kyoto! It’s very green and quiet. It also feels quite touristy, with lots of tourist shops and restaurants. But having said that, it was pretty empty when we got there, at about 10am and it had a lovely atmosphere. …although the twins were more interested in playing with the gravel! The garden wasn’t particularly big so it didn’t take long to explore. (N.B. the garden is not very stroller friendly!) Once we were done we went out of the North gate, which just happened to coincide with the entrance to the bamboo grove. This is a pretty awesome sight and not one to miss if you can help it. Having said that, it isn’t that huge and you can walk through it in about 5 minutes (just in case your expectations were like my husband’s, who was a bit disappointed when we came to the end!). At the other end of the bamboo grove is the entrance to Okochi-sanso. If you like gardens or beautiful scenery, I think you will like this, it was so beautiful. It’s the house and grounds of a film actor (although you can’t go in the house) and is landscaped in a really lovely way. It’s a bit pricey to enter (compared to most of the other attractions we visited) but you do get tea and cake included in the price! It is very hilly so if you don’t like hills or have a stroller or a wheelchair, this isn’t for you – but otherwise I’d really recommend it. After exiting Okochi-sanso from the same place we entered it, we went back through the bamboo grove and just kept following the path (round a few bends) until we came to the main road again. Then we turned right and went back towards the station, stopping for lunch at one of the restaurants (standard Japanese food) before catching the train home. In the evening, we went back to Kawaramachi and turned north up Kiyamachi Street (the last turning on the left before the bridge, which has many restaurants on). At the end of this street, we turned right onto Sanjo Dori and our destination, Genko Sushi, was very close by on the other side of the road. We read this article which suggested it would be quite a child friendly restaurant, and it did have a children’s menu but disappointingly no high chairs. Having said that, the food was pretty good and the children were fairly well contained in our booth. And you can’t come to Japan without having some sushi! We headed to Osaka for a day trip on the metro which runs from Kyoto right to the centre of the city. We got on the Hankyu line at Omiya station and stayed on until the end of the line in Osaka (Umeda station). From there we took the underground to Osakako station, and then a short walk to Osaka Aquarium. We found the underground fairly easy to navigate, although as before, it’s best to plan your journey before you go so that you know when to change. The Aquarium was really good fun and our children loved it (actually their favourite was the otters which was the first thing they saw!). My husband was most impressed by the massive main tank with whale sharks in. It’s a large aquarium, and we spent a couple of hours inside even though we rushed through the last half as the twins were getting restless. One thing to note is that the Aquarium is fairly stroller friendly (there are lifts), but we found it easiest to check in the stroller at the entrance and just wander round on foot. For lunch, we went to the nearby Kuma Cafe (it’s on the same road as the Aquarium, not far away). We chose this place as it’s highly recommended on Tripadvisor and whilst I would question whether it really has the best food in all of Osaka, if you’re looking for some yummy comfort western food in a very friendly, relaxed environment I’d recommend it too! The brother and sister who run the cafe were really lovely and very tolerant of our young children. They recommended that we visit the animal petting zoo in the mall opposite (which also houses Legoland Discovery Center Osaka), but we had already planned to visit somewhere else so we didn’t try it. But you might want to take a look if you have young children! Instead, we headed back into central Osaka on the metro and went to Kid’s Plaza, which we heard about here. If you’ve got fairly young children (I think it’s mainly aimed at under 10s) then it’s a great way to pass an afternoon. When we went, it was a weekday and it was pretty quiet. The middle area is a Gaudi-inspired feature that our children loved climbing and exploring. On the two floors around the outside are various educational areas such as a street of shops to play in, one area with instruments from around the world, and another hands-on science area. Even though our children were a little young to really understand the educational areas, they had a great time trying out all the different things, and the staff were very friendly and helpful too. Days 4-6 follow in the next post! Last September we went on holiday to Kyoto for a week with our young twins. I have to admit that Japan wasn’t very high on our list of places to visit for a long time, but we kept seeing friends’ photos of Kyoto and it looked so nice that we thought we’d go and see for ourselves. I’m so glad we did! It was absolutely beautiful. There is so much to see in the area and we didn’t see half of it, but we loved what we saw and really enjoyed our time there. I thought I’d share with you some of the things we saw and did and hopefully encourage you to go for yourselves! So let me start with the time of year – we went in September as I already mentioned, which is a fairly low season in Kyoto. We chose that time because the flights were pretty reasonable from Hong Kong, and it was warm but not too hot (I hear July and August are pretty hot). However, some days were a bit wet too. If you want to see Kyoto at its best, you should go in March, April or May to see the cherry blossoms in bloom, or in October or November to see the fall (autumn) colours. I’ve seen photos of both and they are spectacular. However, it does get really busy in those periods. One of my main concerns was that I had heard that there is very little English (spoken or written) in Japan, despite so many people going to visit. I had wondered how they managed but actually there was enough English to get around. Most people that we came across spoke a little (including, separately, two old men on trains who were very pleased to have an opportunity to practice their excellent English! ), and most restaurants had English menus – or you could just point to the plastic food that you like the look of (see below)! Whilst on the subject of restaurants, we found that most restaurants were fairly child friendly. I think all of them had plastic bowls and spoons, and our children are happy eating noodles, rice or dumplings so we could find something for them in most places. However, very few have high chairs and in fact many don’t have chairs at all (you sit on tatami mats) so if your children (like ours) are not used to the freedom of unrestrained meals they will probably want to run around a lot! One thing that I thought was quite neat was that there were drinks vending machines everywhere on the streets – so handy if you’re out and about all day. Japan is not so expensive at the moment because the Yen is quite weak and we were actually surprised by how affordable it was. Eating out was pretty cheap and none of the tourist attractions cost more than a few pounds to get into. I think the Yen is even weaker now than it was when we went so it makes for a fairly cheap holiday if you can get cheap flights to Japan! Kyoto has no airport so we flew to Kansai (Osaka) and took a train to Kyoto. This was fairly straightforward – we just followed the signs from the airport to the train station and bought a ticket in the JR ticket office for the Haruka train to Kyoto. It takes about 75 minutes. While buying the train tickets we also bought ICOCA cards which are the equivalent of Oyster cards in London or Octopus cards in Hong Kong i.e. you use them to pay for travel. That made it very easy to get around in Kyoto and the surrounding area. We stayed in a traditional Japanese townhouse, run by a company called Machiya Residence Inn (the specific house we stayed in was Konruri-An). As a young family of four, it worked out very nicely for us. It was a small house but was very well equipped with a kitchen, living room, bathroom and two spacious bedrooms. They were able to provide two cots for us which easily fitted in one of the bedrooms. The townhouses are traditional in style with low furniture and not all are equipped with a sofa or a proper bed, which is why we picked the one we did! They are great to stay in though and (in my opinion) more fun than a hotel! Our townhouse was a 10 minute walk from Omiya station, which made it very easy to get around. We mostly used the metro system but occasionally ventured onto buses as well. My tip for you if you want to use buses is to download or print a bus map before you leave so that you know which buses go where since most of the bus stops do not have any information in English. Once on the buses, the stops are announced in English so you will at least know where to get off! We actually found that Google maps was a great way to find out how to get from A to B. It was accurate for everything we used it for and always gave a few options to choose from. We also downloaded this offline maps app of Japan, which was useful for getting around when we were out and about. The metro is great, although a little more dated than we were expecting, given Japan’s high-tech reputation. The trains are a little confusing though, since not all of them stop at all the stations on a given line. Maps like the one below which can be found on the platform show which train types stop at which stations, so when a train comes along you have to check if it will stop at the one you want. Thankfully, the trains are colour coded so it’s pretty easy to spot which is the one you want. I think that all the metro stations we went to had information in English. One further complication of the metro system is that it is run by multiple companies, so not all the intersecting rail lines join up. You may find that you have to exit a station, walk a few minutes down the road and go into another station to get to where you want to go! In cases like this, I felt that taking a bus would have been quicker, but we didn’t have a bus map which made it impossible for us (hence the tip for you!). For those of you with strollers (or wheelchairs) we found Kyoto pretty accessible. All the metro stations we used had lifts, although only one exit per station had a lift so you couldn’t choose where you came out. There were lifts in buildings and ramps on most stepped areas. 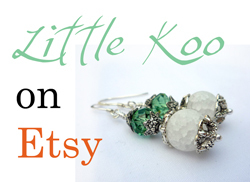 Check them out if you’re looking for some inspiration! 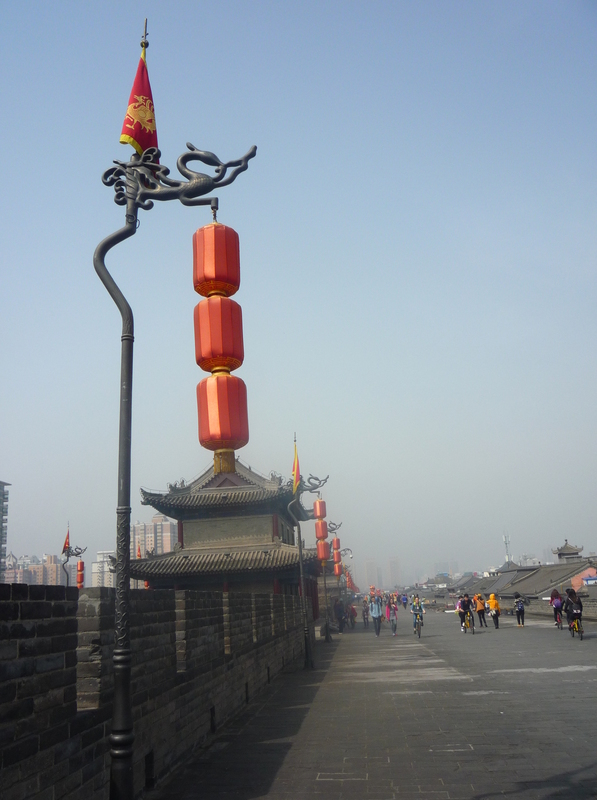 In March we spent a long weekend in the city of Xi’an, in the Shaanxi province of China. 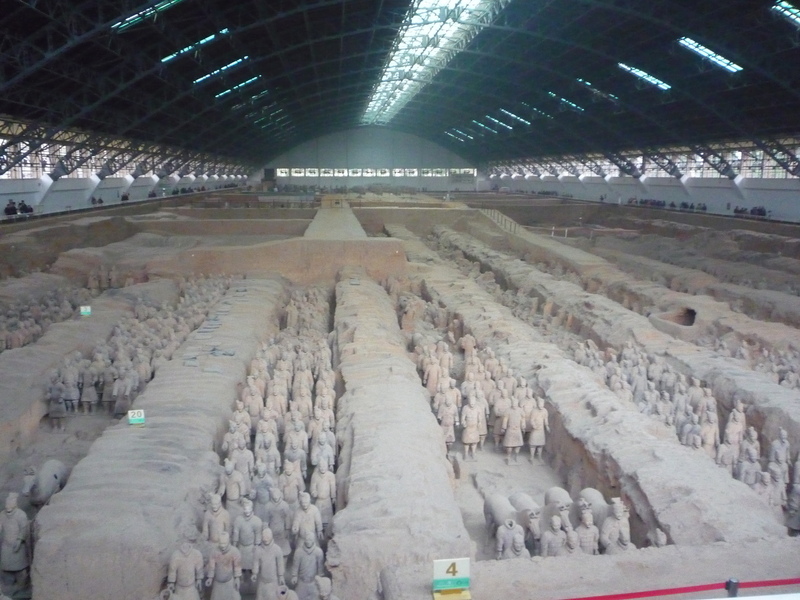 We really only went there because we wanted to see the Terracotta Warriors, but we both really enjoyed our time in Xi’an – it’s a very nice city. We stayed in Citadines Central Xi’an, which calls itself an apart-hotel. I don’t know if all the rooms were apartments, or just the larger ones, but ours was the biggest they had and it was very spacious indeed! Two very large bedrooms, both en suite, with an equally large open-plan lounge-kitchen. It was all newly decorated and very well equipped. The breakfast, which was included in the price, was mostly Chinese with a few western-style options. Not the best hotel breakfast I’ve ever had, but adequate to fill you up at the beginning of the day. The hotel was really well positioned, just a few minutes walk south of the Drum tower. There were a few small 7-11 type convenience stores nearby which were useful for buying milk and snacks for the twins. If you wanted to go shopping, there were plenty of shopping malls nearby too, although we didn’t go in any! We arrived at our hotel mid-afternoon and after relaxing in the room for a little while we headed over to the market in the nearby Muslim quarter where there are lots of food stalls，particularly along Beiyuanmen (北院门） and West Yangshi (西羊市). We enjoyed wandering round, trying different things from the stalls. One of the best things we tried was a kind of ‘burger’ which was shredded beef in a flatbread. It was really good! There was a great atmosphere and lots of random sights to see, smell and taste. The drum tower was nicely (and brightly!) lit up at night. There is a nearby bell tower, which sits in the middle of a roundabout, but we didn’t visit it. 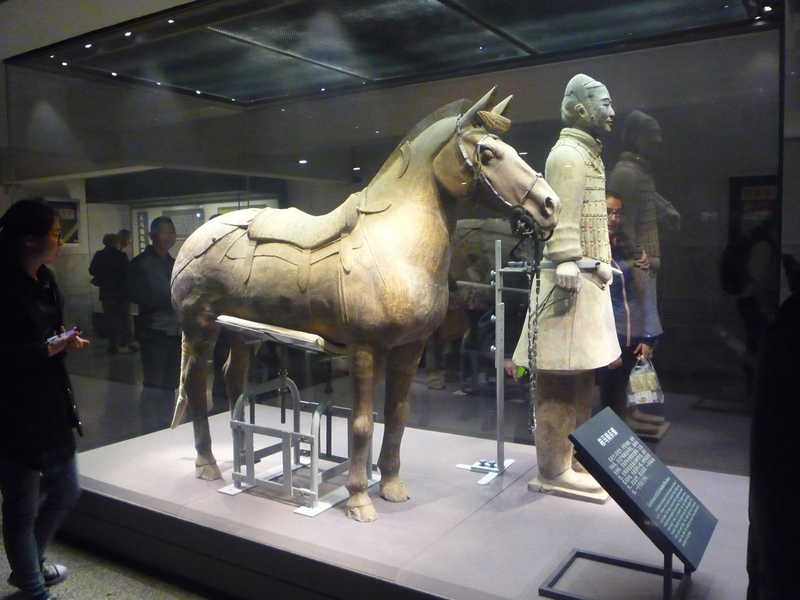 Our first full day was a Friday so we decided to head straight to the Terracotta Warriors, as we thought it would be more busy at the weekend. There are regular buses that go from Xi’an train station but we thought it would be a bit of a hassle to get to the train station and then get the bus (and do the same in reverse) with the twins, so our hotel organised a private car for us, which wasn’t that expensive and was very convenient. I forget how long it took to get there, but I think it was the best part of an hour. Once there, you are met with a wall of potential tour guides (we declined, preferring to take things at our own pace), you buy your ticket and then have to walk through a kind of park to actually get to the site of the of excavations. 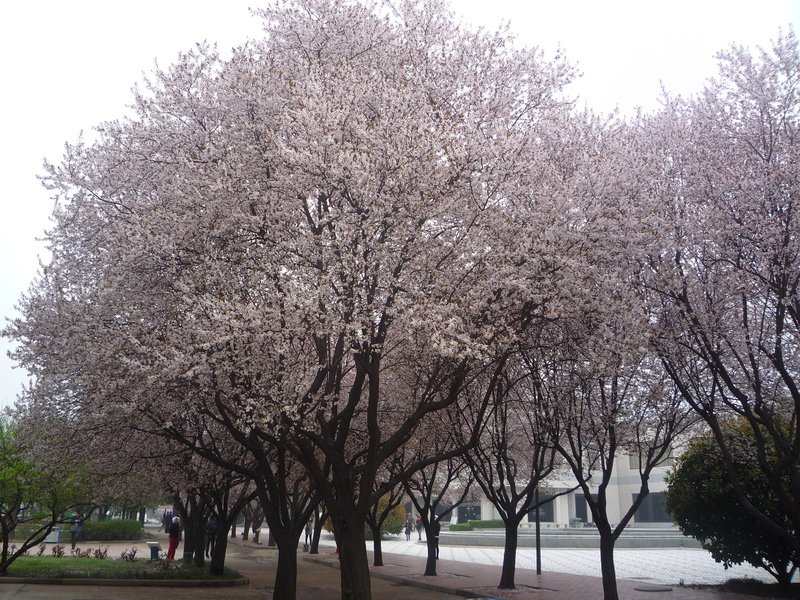 The cherry blossoms were starting to come out so it was really pretty. Once inside, there are 3 pits that you can visit. We chose to go to Pit 2 first. It was much bigger than I was expecting, and much less excavated! The most interesting thing for me was that a few areas were excavated, showing the warriors in situ, as they were first discovered. It makes you realise why it is taking them so long to excavate the whole site! It must take a lot of work! There are a few warriors in cases here, so you can get a real close up look at the detail. There is also a photography area where you can get your photo taken with fake warriors. We don’t usually go in for photo opportunities but indulged ourselves for once (at only 10 yuan per person, and they didn’t charge for the twins) – I doubt we’ll ever go back, so it was worth it for such a great photo! Pit 1 is the most impressive, and best left till last. 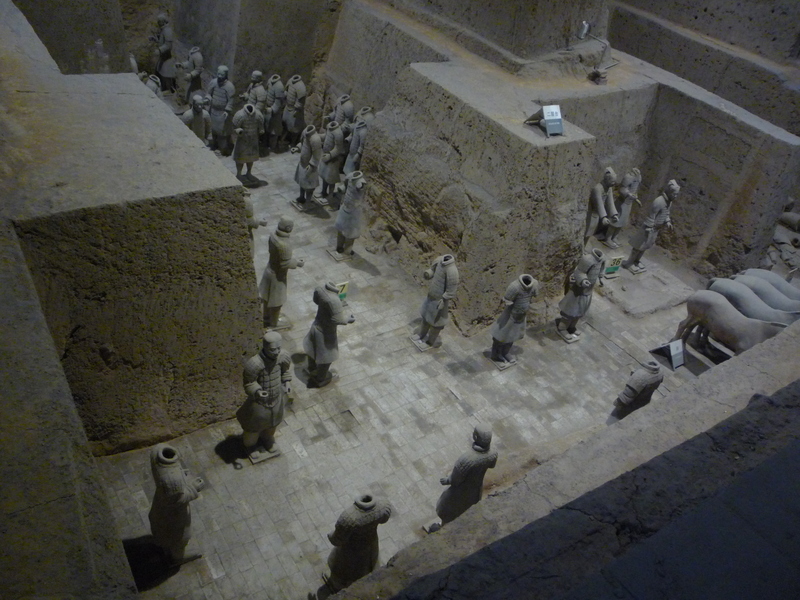 Just the number of warriors is astonishing, and the excavated area only takes up about half the building, so I’m not sure if there are more to be excavated here. You also get to see the process of putting the warriors back together again, and processing them. Wandering around the pits took us the whole morning (although we didn’t go in the museum bit), so we stopped for lunch at one of the many restaurants outside the site (not amazing, but adequate) and headed back to the hotel. That evening we decided to go to Defachang (德发长) for dinner, which is a famous dumpling restaurant situated between the drum and bell towers. The restaurant has two floors, and we decided to eat upstairs which is more like a proper restaurant, whereas downstairs was more of a fast food canteen (the logic being that we didn’t want to be rushed with the twins). In hindsight, I think the downstairs would have been adequate! But anyway, if you like Chinese dumplings, this is a good place to come! 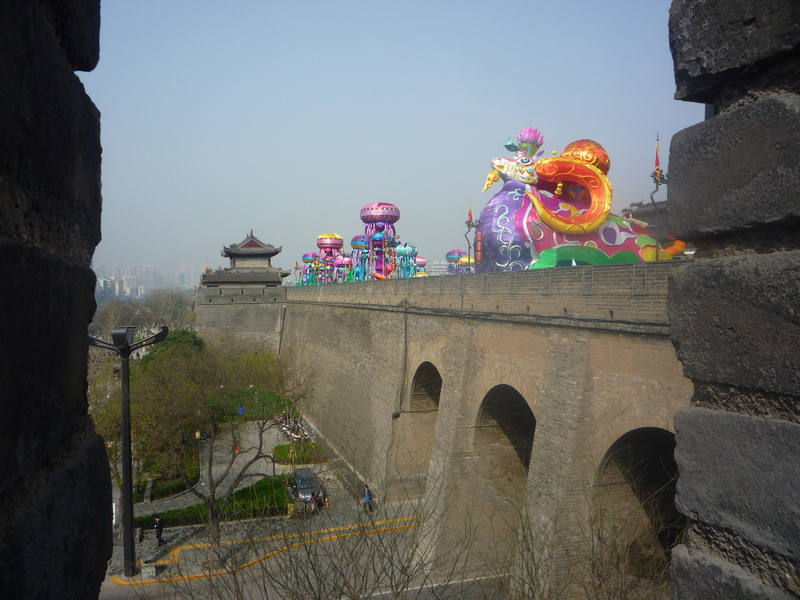 The next day we wandered south from our hotel to the south gate of the city wall. It’s a very impressive sight! At the bottom of the gate is a small ticket booth, so we bought our tickets and headed in. First you have to climb a lot of steps to the top of the wall, and then you are free to roam. The wall is wide and straight and you can hire bicycles to ride around it (we didn’t do that!) or just walk. It will take you several hours to walk the whole way round the wall (we didn’t do that either!). 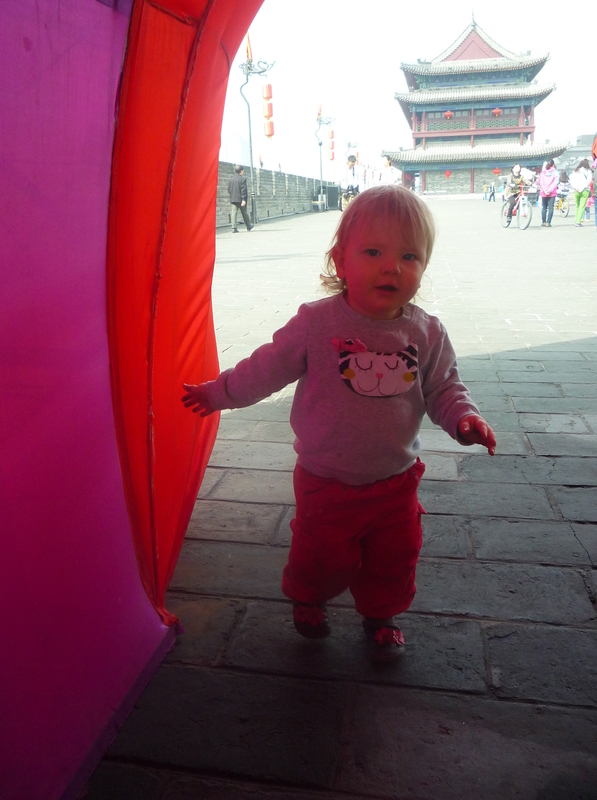 There were a couple of buildings on top of the south gate so we let the twins run around and investigate for a bit. 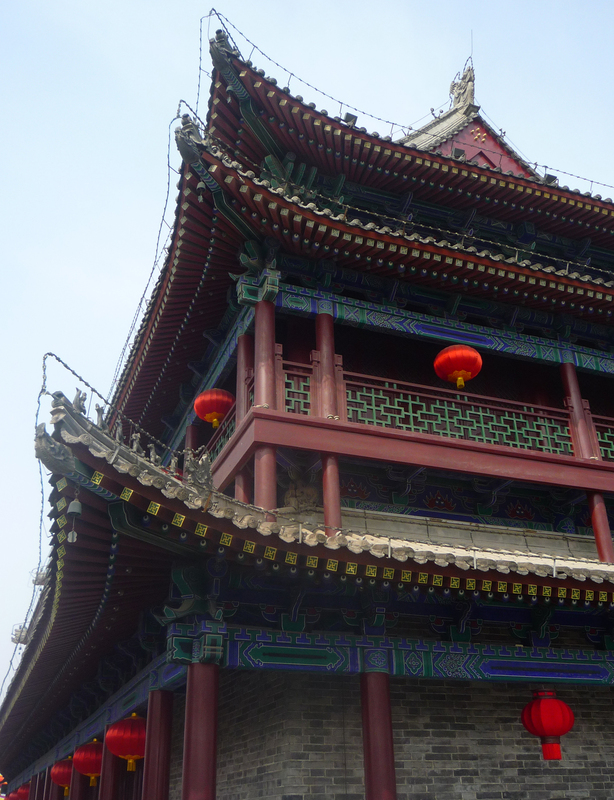 I do love Chinese architecture, so beautiful! 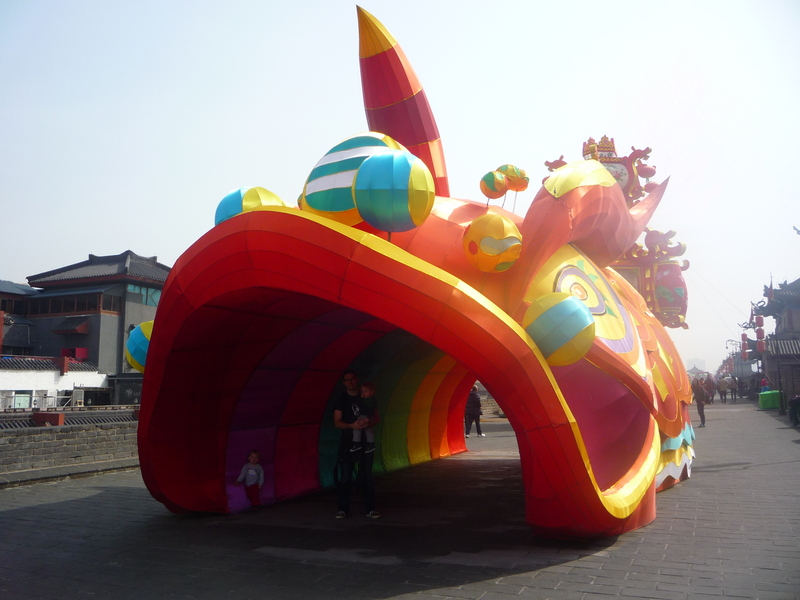 There were also some odd sea-themed displays up around the south gate. Jack and Isobel enjoyed running around them! We headed west from the south gate for a while and then took the next available place to descend back to street level. Our thoughts started to turn to lunch and we headed for the Muslim quarter where we popped into one of the small restaurants along West Yangshi (西羊市）for some dumplings. From there, we decided to visit the Grand Mosque which was nearby. The mosque was really beautiful, and not really what you expect from a mosque. 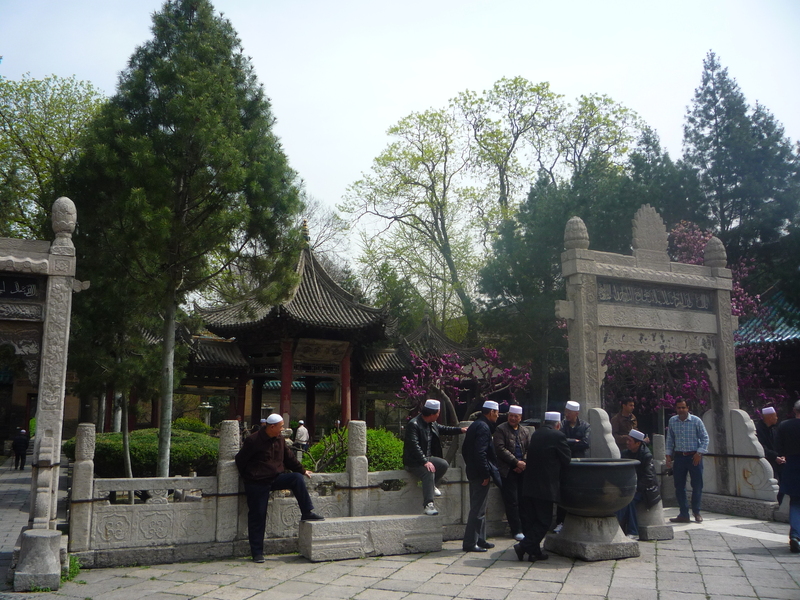 The architectural style is very Chinese, but there is Arabic writing everywhere and some Arabic influences can be seen. The central area is very open with beautiful pagodas and landscaping. It’s also surprisingly peaceful, given the bustle of the narrow streets outside! For dinner, we went to East Mutoushi street (东木头市). There are lots of restaurants there, many of which are pretty basic. We went for one of the trendier ones (unfortunately I don’t remember the name), and the food was lovely. There was also a Walmart nearby which was handy for picking up more supplies. On our last morning we booked a food tour with Lost Plate. It was such a great way to end our holiday! Our guide was lovely and spoke excellent English. We were given a range of foods from stall vendors and small cafés, and none of it was what you would really expect from Chinese food. No rice in sight, for a start! (except for a sticky rice dessert) Apparently, the area around Xi’an is very dry so they don’t grow much rice or vegetables – as a consequence, they eat a lot of breads and stews. It was market day so we were also taken on a tour of the local market (which just happened to be ridiculously busy that day) – it was massive and you could buy just about anything there! And we were the only tourists that we saw the whole morning! 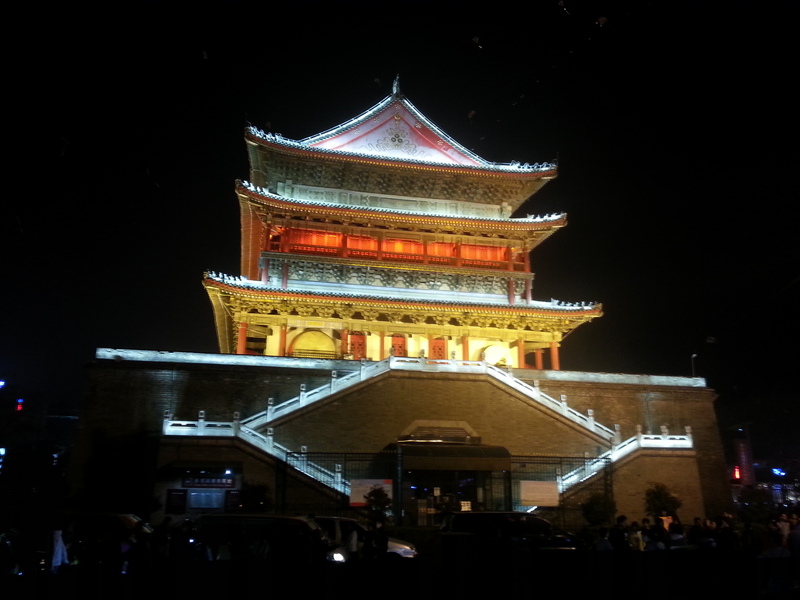 So that was our weekend in Xi’an. The city itself was a lot nicer than I was expecting (I didn’t know what to expect at all) and it was a really interesting place. 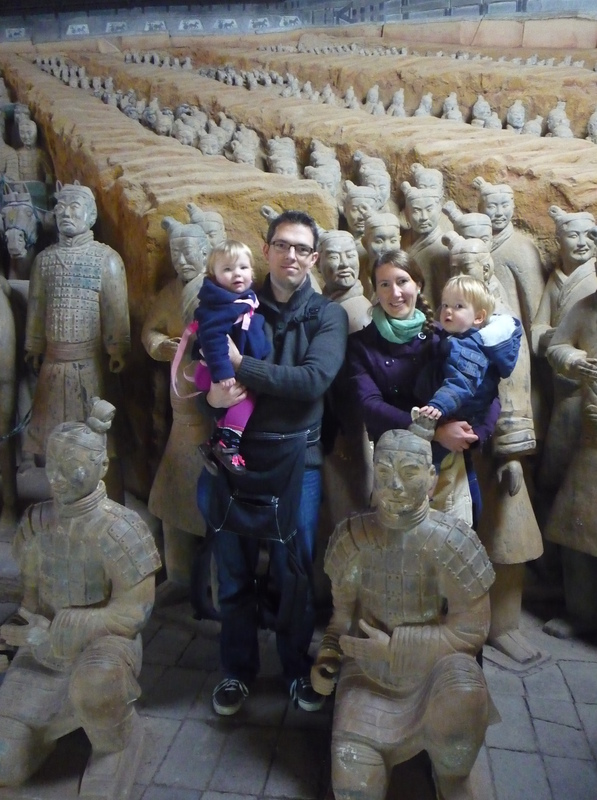 Because we had the twins with us we didn’t try to do too much, but there are lots of other things in Xi’an that we didn’t visit, such as the Wild Goose Pagodas (Giant and Small), Xi’an Museum and the Mausoleum of the first Qin emperor. 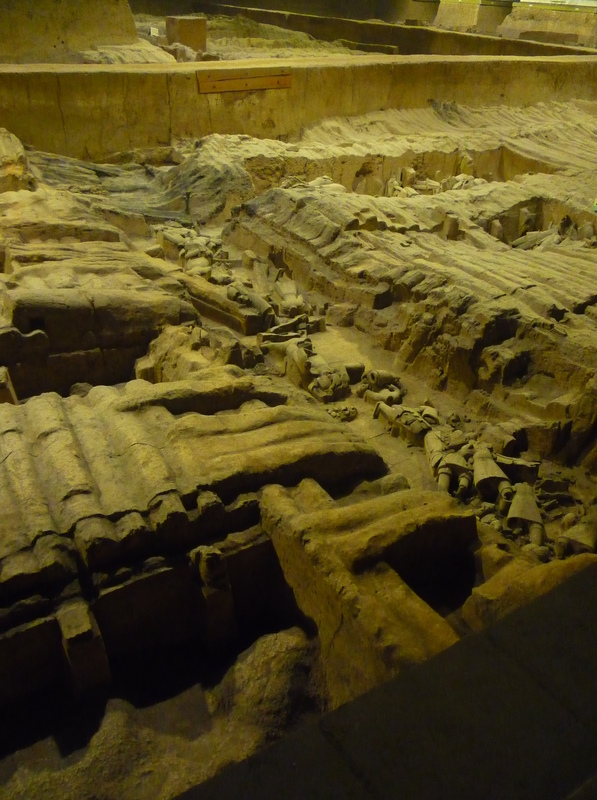 So you could fit a lot more into your time in Xi’an if you wanted to! Firstly, there isn’t a huge amount of English in Xi’an. But there is some, and it’s amazing how much you can get by with gesticulating! Tom speaks a moderate amount of Mandarin so that made our lives a lot easier. I think if you had a good guide book to help you get around then you would be fine. Secondly, Xi’an is pretty touristy, but mainly with Chinese tourists. This makes it quite busy, but also means that as a westerner you are likely to stand out. And if you happen to be westerners with small, blond twins, you will stand out a lot! The twins got an awful lot of attention, even more than in Hong Kong, and can now be found in the holiday photos of many, many Chinese tourists. Some people asked to take photos but most didn’t. One or two people actually picked the twins up without asking, which is a step too far in my book. If you really mind this sort of thing and have young children then you might want to think twice before going to Xi’an, or indeed anywhere in China. We decided that we could put up with it for a long weekend but we’d think twice about going into China for any longer periods! 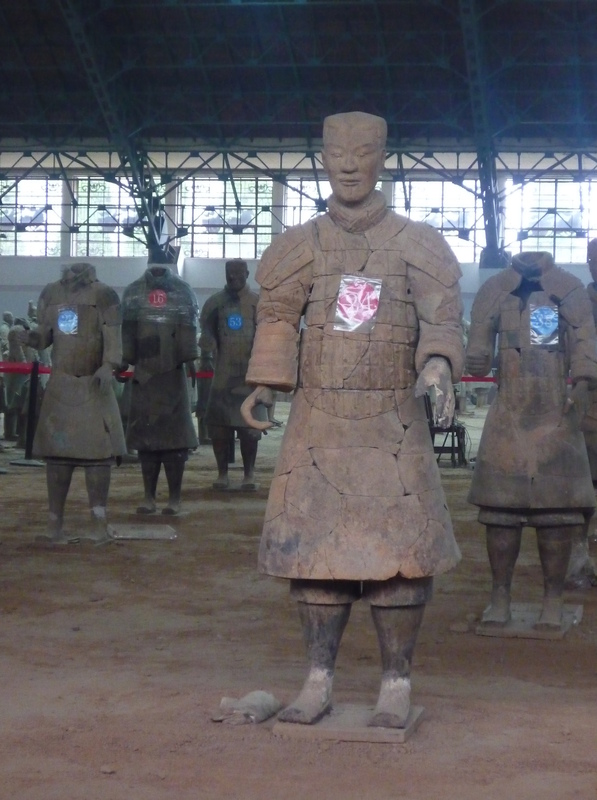 Have you been to Xi’an? If you have, let me know what you thought! I’d love to compare notes! 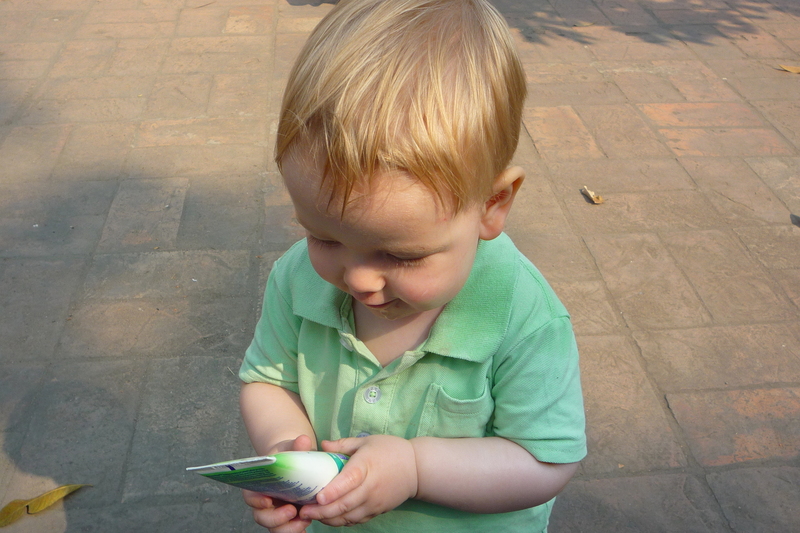 In February, we undertook our first ‘proper’ family holiday to Thailand. We spent 4 days in Chiang Mai, a city in the north of Thailand, and 3 days on the beach in Phuket, which is an island in the south. There’s not much for me to say about Phuket, we stayed in a nice apartment and spent the whole time in the pool or by the beach! But I thought I’d tell you about Chiang Mai. Chiang Mai is a really nice city to visit. It doesn’t really feel like a city because the areas you are likely to visit or stay in are in general low rise and fairly quiet. 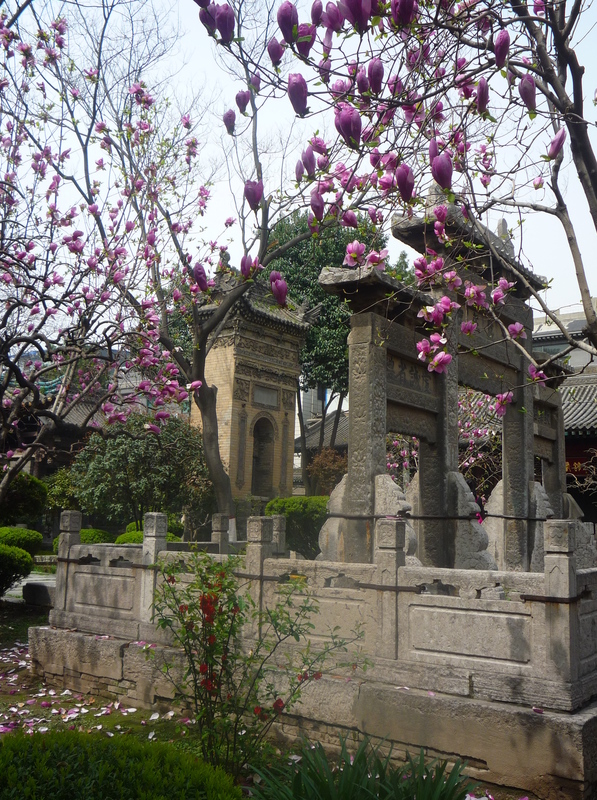 The old city centre is enclosed by a square moat and seems to be mostly made up of temples! (I am joking, but there are a seriously large number of temples). We stayed a little way outside the city centre in an area called Nimmanhaemin. We chose to stay here simply because it was cheaper than staying in the city centre but closer to it than some hotels which seemed to be outside of Chiang Mai itself. However, we seriously lucked out! The area is full of restaurants and coffee shops and has a really laid back, trendy feel. It was perfect for us because we never had to venture far to find food (which is a blessing when you have small children). Also, there were loads of red taxis (which looked to me like pick-up trucks with a roof put on the back) so when we did want to visit the city centre we could easily do so and it only took 10-15 minutes. 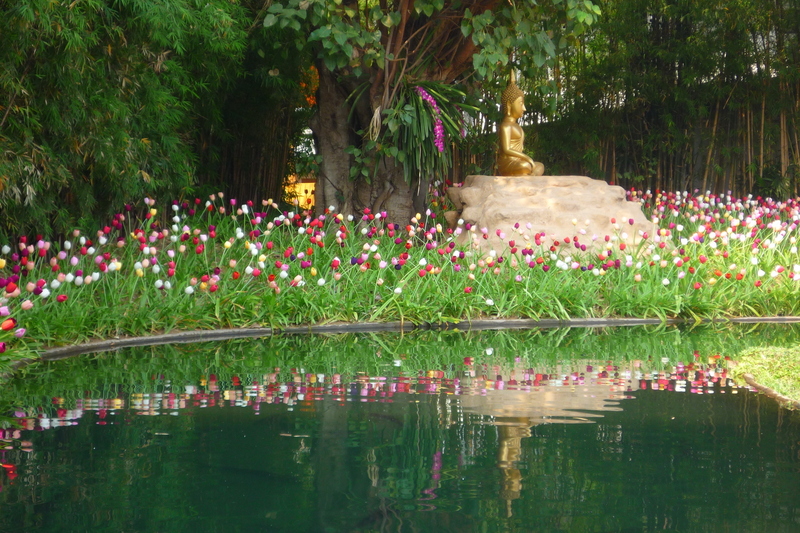 We stayed at the At Pingnakorn Nimman Hotel which was well reviewed on Tripadvisor. We booked a 2 bedroom suite which suited us perfectly. There was a shower room and a large bathroom, two large double bedrooms and a sitting area with a small couch, dining table and chairs, and a corner kitchen area with a fridge, microwave and sink. The room was beautifully decorated, like the rest of the hotel, in an ornate but light style. I found it quite charming, but it’s not your average hotel decor! (see photos on the website to see what I mean about the hotel decor) But it was very clean and well kept. The rate included a great buffet breakfast with a range of western and Asian food. We also liked the rooftop garden as it gave the twins a little bit of space to run around. The only negative thing I can say about the place is that we had checked beforehand that they had two cots for the twins, and we were reassured that they did, but when we arrived, one was being used by someone else so they only gave us one. In the end, Tom had to put his foot down and strongly pointed out that we had been promised two cots, and a suspiciously new looking cot arrived in our room not long after that! Oh, I just remembered something else! This whole area of Nimmanhaemin is under the flight path from Chiang Mai airport, so if plane noise is an issue for you, I wouldn’t recommend staying here. We didn’t mind it but it was fairly loud. 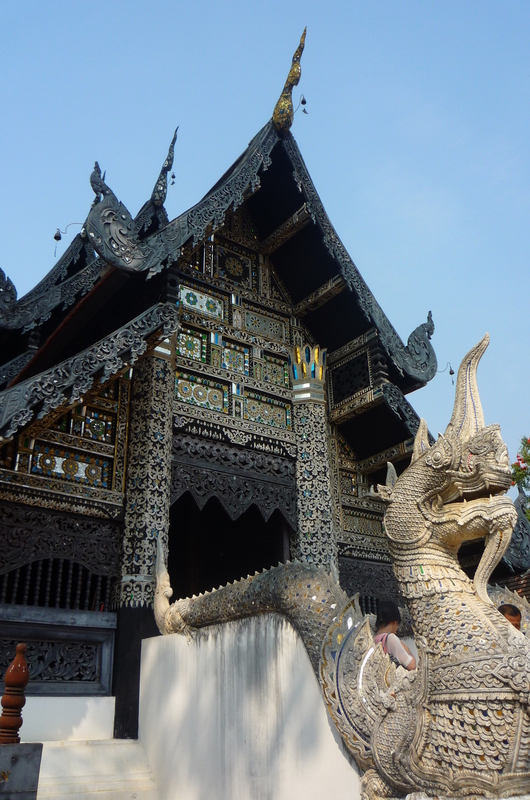 So what did we do in Chiang Mai? To be honest, we only really scratched the surface of the place, since we wanted a relaxing holiday rather than dragging the twins here there and everywhere, which would have been not at all relaxing! On our first day we headed into the old city centre and visited some of the temples. 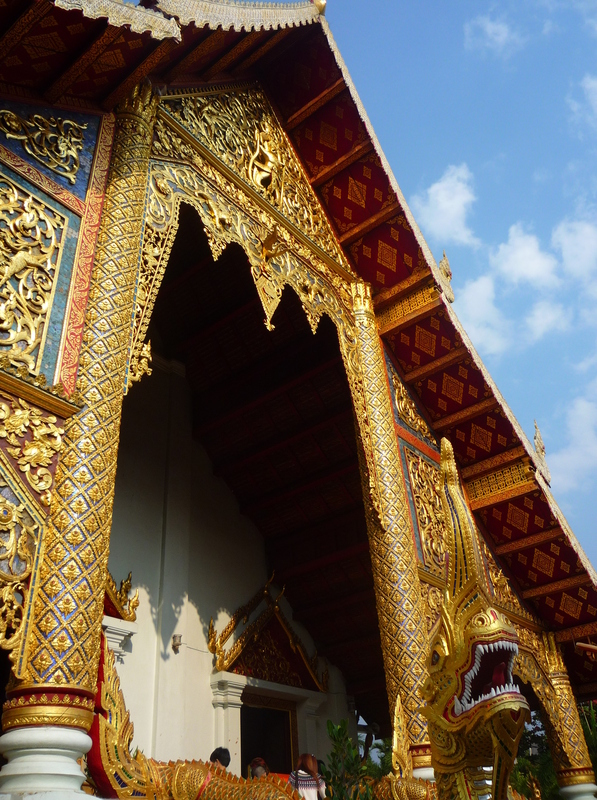 We started off with the most prominent temple Wat Phra Singh. 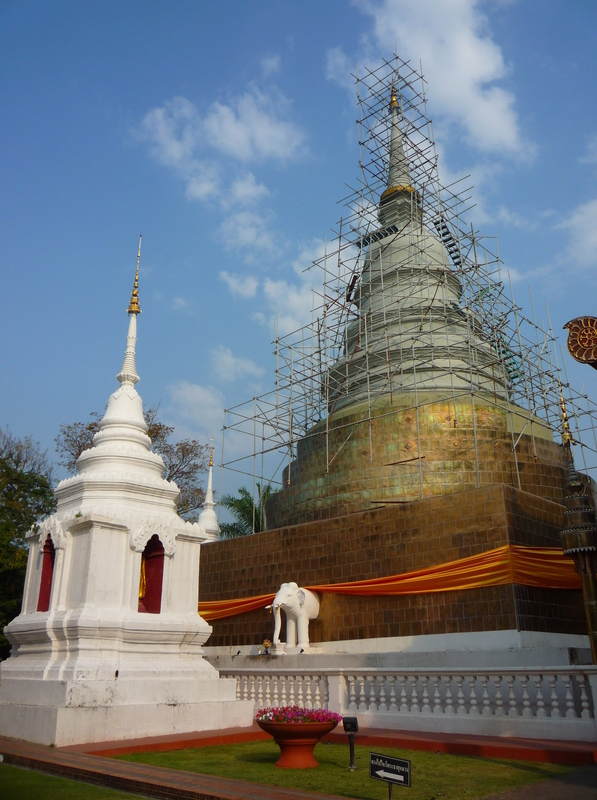 Unfortunately, the chedi here was covered in scaffolding (which seems to pop up around pretty much every historic monument we visit) but you can just about see it underneath. 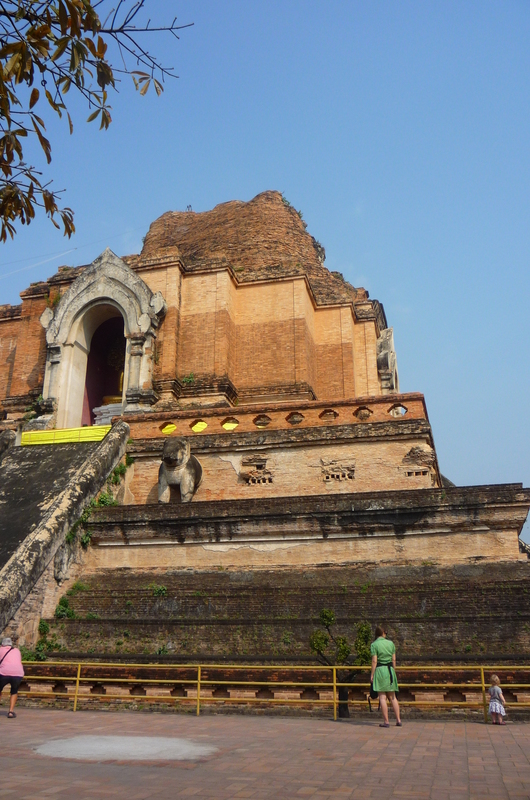 Our next stop was Wat Chedi Luang, a massive ancient chedi which has been partially restored (it’s pretty obvious which bits have been restored). In the picture below, you can just see me and Isobel standing at the foot (Isobel enjoyed playing with the balustrade). Behind the chedi (to the west) were a few smaller buildings, including this tasteful wooden one which was a monument to a prominent Bhuddist scholar (sorry, I didn’t take a note of the name!). I also didn’t note the name of this temple, which was next door to Wat Chedi Luang on Th Phra Pokklao. Another pretty wooden building! Behind it was a small but very pretty garden, full of beautiful flowers! We also managed to squeeze in an ice cream and some lunch around our temple viewing, and that was our first morning in Chiang Mai. I don’t think we did much else that day! 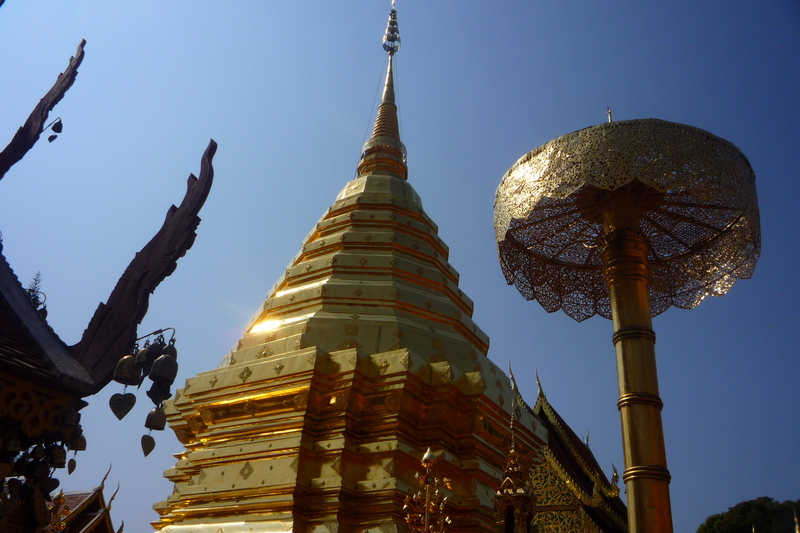 The next day we decided to head up to Wat Phra That Doi Suthep, which is a temple complex in the hills above Chiang Mai. We got a red taxi both ways, which I’m not sure if I would do again! It’s a very windy road up the mountain and visibility is quite low in the back of the taxis so it was a bit nauseating. One thing I would suggest is that you should pay the taxi to wait and take you back down again. It doesn’t cost much more than getting two separate taxis. We didn’t do that and the only taxis going back down wait until they’re totally full (a bit of a squish) before they go so we were waiting a while before we could go down. It’s also nicer to have more space in the back of your own taxi! Anyway, we’re not very cultured and the place was pretty busy so we didn’t perhaps get the best experience of the temple. Also, it was quite hazy so we didn’t get any real view of Chiang Mai either. But it is quite pretty, and very gold! In the late afternoon we went back into the city centre to see the Sunday walking market. One of the main east-west roads in the centre (Ratchadamnoen Road) is closed on Sunday evenings and becomes a market full of hundreds of stalls selling all sorts of crafts, decor, clothes, food etc. We got there just as it was starting (some stalls were still setting up) and really enjoyed wandering around lots of the stalls and picking up lots of street food to eat along the way. It was a really nice market with lots of unusual and beautiful goods, some of which were obviously massed produced, but some of which were definitely handmade. A great place to pick up souvenirs! (Chiang Mai also has a daily night market but we didn’t visit it – many of the guides say that it is just full of touristy tat, but the Sunday walking market is much better) As I said, we got there pretty early (maybe around 5.30pm) but by 7pm it was pretty busy so we decided to head back home to put the twins to bed. Those were the main things that we did in Chiang Mai. We also visited the park in the south west corner of the city centre (Buak Hard public park) which was a nice open space for the twins to run around in (although there are lots of ponds for children to fall into if you let them!). We didn’t actually use the playground there as it was pretty busy and had sand underneath, which was a level of messiness we couldn’t be bothered with! We also hit the play area in Maya mall (called Maya Fantasia) one afternoon since it was near where we were staying and the twins needed a run around. It’s a nice new play area and the twins were occupied for the best part of an hour, which is pretty good going! There are lots of things around Chiang Mai which we didn’t do, such as visit the zoo (although I’ve heard mixed reviews), elephant sanctuaries and a tiger sanctuary. But as I said, we just wanted to see a few things and relax away from home! 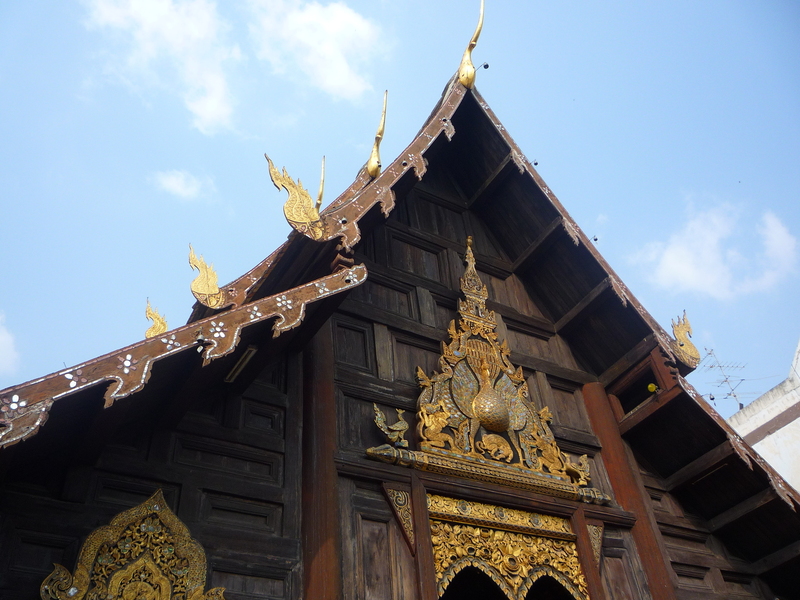 Chiang Mai is lovely and laid back and was a great contrast to Hong Kong’s busy-ness. I’d recommend it for a nice slice of Thai life! First of all, Chiang Mai isn’t very stroller friendly! I think it varies, but many of the areas we visited only had intermittent, very narrow pavements. We took the twins round in carriers almost the whole time we were there, the only exception being the Sunday walking market, when you have a nice wide flat road to push a stroller around on! Also, most restaurants don’t have high chairs. We gave up looking not long after we arrived, and instead found that we could fasten the twins into normal chairs using their carriers! Finally, both this and this article on Chiang Mai with toddlers were very useful and have lots of other toddler friendly activities.